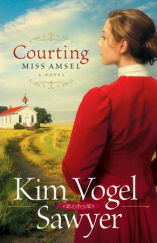 This week, CFBA is introducing Courting Miss Amsel by Kim Vogel Sawyer. Honestly, Kim has become a favorite of mine and Courting Miss Amsel is just another sweet, prairie read to add to my KVS collection. I just loved Mrs. Kingsley and her interaction with Edythe - reminded me of my favorite 'classic' characters, Marty and Ma Graham in Janette Oke's Love Comes Softly series. I also enjoyed Edythe's teaching methods - wish I'd had such a creative teacher! Kim does such a great job developing her characters. They are so real, and you can't help but connect with their struggles and emotions. Although I didn't feel that Courting Miss Amsel had as much spiritual references as some of Kim's past books, she is really good at weaving scripture into her stories. So, if you haven't yet read a book by Kim, I urge you to! I don't think you'll be disappointed! Oh, spring...? And a GIVEAWAY!